SXSW brings Indie’s of all kinds to Austin, Texas! Prepare yourself! You are in for a treat if you plan to go to SXSW this year. SXSW is listed on our "Top Indie Events of the Year" and it's location of Austin, Texas has made our short list of the "Most indie Cities" list due out later this year. If you haven't heard of SXSW (South By South West) before, this is a great year for it to be the first time. If you have heard of it, there are a ton of things you'll be seeing for the first time so you win too. SXSW has always been a great annual stop for the best in indie music and film with SXSW MUSIC AND MEDIA CONFERENCE and SXSW FILM CONFERENCE AND FESTIVAL. 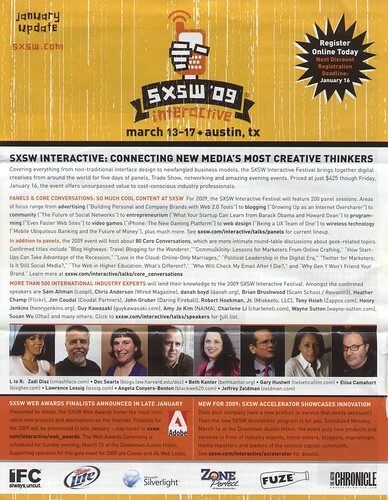 This year they welcome a third piece to the independent puzzle, with SXSW INTERACTIVE FESTIVAL .They describe this festival designed for media and net pros as a way to "celebrate the creativity and passion behind the coolest new media technologies. In addition to panel sessions that cover everything from web design to bootstrapping to social networks, attendees make new business connections at the three-day Trade Show & Exhibition. The newest element of the event is ScreenBurn at SXSW, which adds specific gaming industry programming as well as a three-day Arcade to the mix." I'm excited as hell for this years festival and hope that I'll see you there. You go ahead and plug that company Ernie, something tells me they’re good at what they do AND they’re independent. A match made in heaven and one we want to know about.